Bali, one of the most popular islands in the world, and also known as the tourist – spot. According to a recent survey, Bali is still on the top of most wanted to visit island in the world and it is the most visited place in Indonesia. Indonesia itself, a country which is rich in cultures and natural scenery has many islands which can offer the tourist the same natural scenery or perhaps more than Bali. But despite all those, Bali is still reigning. There are many things to do in Bali, places to visit, celebrations to participate even some culture acts to witness. Bali is rich in culture, mostly the Hindu culture. This is because the majority of Bali populations are Hindu, unlike the majority of Indonesia populations which are Muslim. 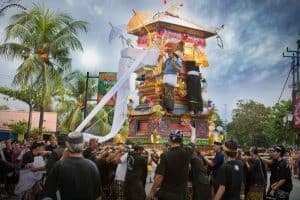 You can witness a lot of different ways of celebrations the holidays in Bali due to this. Perhaps, that could be one of the reasons why Bali is so popular among the tourists. Bali has a way of having a ceremony for each new period in human’s life, starting from the birth, naming ceremony to death ceremony. Bali people, or Balinese, as they like to call themselves, truly believe that each of us will enter a new stage in their life from birth to death and to embark the new beginning, they will perform many rituals. Mostly the rituals are to give thanks to the gods and some are to honors and remember the deaths, like give sesajen. Out many rituals in Bali, one that we are going to take close look at today is the cremation ritual in Bali. The cremation ritual, or as the local calls it, Ngaben, is the final ritual performed to the death. Balinese people believe that human body is consist of five elements, water, fire, earth, sky, and air, and when we died, our body should be reunited with the earth, hence the cremation. However, the cremation is not just about burning the dead bodies, there are a lot customary and rituals to follow before and after the ceremony. What is Cremation in Bali? Ngaben or also known as Pitra Yadyna or Pelebon is a cremation ceremony in Bali. Bali people, who are mostly Hindu are adopting the funeral ritual as the Hindu people around the world do. The cremation in Bali is one of the many rituals performed in order to release the soul of the dead so it can the upper realm, nirvana or heaven as they called it. Bali people strongly believe in the concept of being reborn, where the dead will be born again in this or next life, and this cremation ceremony is the first way for their soul to reach the realm and wait for the cycle of rebirth. Balinese also believes in Hindu mythology and theology of good versus evil. Apart from the heaven or the upper realm where the souls of the dead are waiting for rebirth, they also believe of the resident of evils, or lower realm, which can capture these souls. They believe that once a soul has reached the lower realm, they will not be reborn again or that they may turn in to a bad entity. A proper cremation will also increase the chance of the souls getting to upper realm. Cremation in Bali is usually one of the most expensive rituals to perform. In Bali, before the cremation, people go through a burial ritual where they bury the dead for some time. Usually, this burial ritual is being conducted near a temple called, Pura Prajapati. This burial ritual will act as an interim state. Due the funds needed for cremation for cremations is quite high, they will go through this interim state until they are financially ready. Once the family members are financially ready, they will select a day to perform Ngaben or the cremation ceremony. The family will a coffin to carry the dead which they call it bade. They will also announce to the people in the neighborhood or the village about the cremation ceremony. The dead will not be cremated alone. The family will make patulangan, which is shape created by using bamboo, wood, or paper to burn the dead with. The shape will usually be a bull or lembu, as the local calls or any mythical animal shaped. They can also create a wadah, a temple like shape. The family believes that either one of these shapes will act as a companion for the dead in reaching the upper realm. Once all is ready for the cremation ceremony, the corpse will be bathed, cleaned and dressed in his / her best attire. Usually, this attire will be a Balinese attire. The corpse will be placed in the coffin as mentioned earlier where friends and families will pay their last goodbye with mourners and prayings. The family will also be dressed in traditional Balinese attire. Then, they will carry the coffin which as the corpse in it with prayers rites and singing with music from gamelan to the cremation grounds, which they call it kuburan (grave). When they have to walk on the path where it has major road crosses, the coffin then will be rotated three times. This has to be done as an act to confuse the evil spirits of the lower realm so they will not be following the dead. Once they reached the cremation ground or the kuburan, the corpse will be taken out of the coffin and will be places with the patulangan, the bull – shaped or the wadah. Final prayers and hymns are being recited and the corpse will be set to fire. While the corpse starts to burn, a team of music player will play the traditional balinese music called beleganjur will be played continuously. The reason of choosing beleganjur because it symbolizing the fight between the soul and evil lower realm residents in reaching the upper realm. After twelve days of the cremation, the family will come back to kuburan to collect the ashes. The ashes will then be filled insed coconut shell and carry to a nearby water source, river or sea and the ashes will then be spilled into the sea, as the end of the cremation ritual. Dress modestly. If you can’t find a traditional Balinese attire to wear, you can still attend the cremation ritual by dressing modestly and appropriately. Act normal. Cremation is not a tourist attraction. Respect the dead and the families. Don’t compare or rattled by religion. Don’t take a photo of the cremation ritual or take selfies during the ritual. Lastly as the saying goes, where we step our feet there we should carry sky. It simply means that where ever we are, we should be able to learn to adapt with the culture and respect the culture. Balinese, just any other tribe around the world and in Indonesia, really holds high of the traditions and cultures where they have been taught from generations to generations. While we are there, we are welcome to participate and witness these rituals, but at the same time, we need to respect it.